Over the last decade, the adoption of wireless intercom in Asia Pacific has witnessed a significant upswing. The infrastructural development in this region has boosted the need for efficient security systems, of which wireless intercoms are essential parts. This factor has been driving the demand for wireless intercoms in this region remarkably. Analysts at Transparency Market Research project this trend to remain growing over the next few years, leading to an upsurge in the adoption of wireless intercoms in Asia Pacific. In 2014, the opportunity in wireless intercom across Asia Pacific was worth US$0.4 bn. Rising at a CAGR of 12.30% between 2015 and 2023, it is estimated to rise up to US$1.1 bn by 2023. Event management, security and surveillance, hospitality, retail, and transportation and logistics are the prime application areas of wireless intercoms. Among these, the security and surveillance segment has emerged as the leading adopter of these intercoms. The rising crime rate has increased the concerns over security among people in Asia Pacific, leading to the growing demand for robust security solutions. Hence, wireless intercoms, being an important part of these solutions, has also witnessed a surge in demand in the recent times. In 2014, the revenue generated by the application of wireless intercoms in the security and surveillance segment stood at US$100.7 mn. Expanding at a CAGR of 13.2% between 2015 and 2023, it is likely to reach US$302.5 mn by the end of 2023. The wireless intercom market in Asia Pacific stretches across Oceania, ASEAN, China, and the Rest of Asia Pacific. The Rest of Asia Pacific, including India, Taiwan, Japan, Pakistan, South Korea, Bangladesh, Fiji, and Sri Lanka, led the overall demand for wireless intercoms in 2014 with a share of nearly 40%. The rising number of industrial complexes, commercial infrastructure, and special economic zones (SEZs), owing to the rapid industrialization, has boosted the application of wireless intercoms in economies in the Rest of Asia Pacific in the recent past. Looking forward, these intercoms are likely to witness a significant adoption in the security and surveillance, hospitality, and retail sectors in many of the countries in the Rest of Asia Pacific over the next few years. In Japan and South Korea, the application of these intercoms will experience a rise in the event management industry while in Pakistan, Bangladesh, and Sri Lanka, their demand will rise in the security and surveillance sector. By the end of 2023, the opportunity in wireless intercoms across the Rest of Asia will increase up to US$2.1 bn from a US$0.83 bn in 2014. At the forefront of the Asia Pacific wireless intercom market are Clear-Com Ltd., Commend International GmbH, and RTS Intercom. Other prominent wireless intercom manufacturers in this region are Panasonic Corp., Zenitel Group, Sena Technologies Inc., Riedel Communications GmbH & Co. KG, and Telephonics Corp.
A wireless intercom enables wireless transfer of audio signals between a base station and end terminals (handheld headset, belt pack, speaker station) in any application. Wireless intercom has one base station and multiple belts packs or substations. These belt packs communicate with one another through the base station. Wireless intercom provide such as single, dual, and multiple channels for communication through which the belt packs are connected to one another. The report covers wireless intercom systems that have a base station connected with an analog, digital, or IP-based communication medium in order to connect with other intercom systems. Hence, the report only considers the wireless base stations in the segment. The market is segmented on the basis of technology and industrial verticals where wireless intercoms are used. Wireless intercoms communicate through the radio frequencies (RF), Wi-Fi, and other technologies, such as Bluetooth, providing mobility to the end-user. The RF and Wi-Fi segments are further divided on the basis of frequency range, providing the revenue and volume distribution for APAC. Furthermore, recent technological developments have helped wireless intercom manufacturers increase the range of their and accommodate more belt packs in a system. The industry vertical segmentation provides a complete range of end-use industries in which wireless intercoms are commonly used. Wireless intercoms mainly find their application in the area of security and surveillance to facilitate internal communication. Security authorities are carrying the belt packs and communicating with each other through the base station as managing the flow of people in and out of a facility is gaining importance owing to the increasing threats. Further, with increases in investment in the areas of hospitality and transportation, the application of wireless intercoms is expected to increase in these areas in the coming years. The report provides an in-depth analysis of the APAC wireless intercom market based on application/end-use industry, technology, price, and geography. 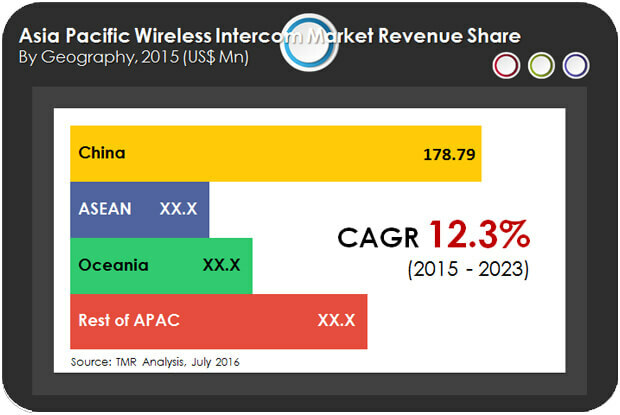 In terms of geographical regions, the report segments the Asia Pacific wireless intercom market into China, ASEAN, Rest of Asia Pacific and Oceania, which are analyzed in terms of revenue generation and volume. ASEAN is further segmented into the Philippines, Indonesia, Thailand, Malaysia, Singapore, Vietnam, Cambodia, Myanmar, and others, while Oceania is divided into Australia and New Zealand. The report also segments the wireless intercom market on the basis of application/end-use industry into retail, event management, hospitality, security and surveillance, and logistics. Segmentation of the market on the basis of technology is into Wi-Fi by frequency, RF by frequency, and RF by channel. Furthermore, the report analyzes the factors that drive and restrain the growth of the wireless intercom market. The report also discusses the prevailing market trends, prospective growth opportunities, and major strategies increasing the popularity of wireless intercom systems. It also provides the market estimates and forecasts for all the segments in terms of revenue. Also provided is the market positioning of key players, distribution channel analysis and top brands in the Asia Pacific wireless intercom market. Additionally, the report includes competitive profiling of the major players engaged in offering wireless intercoms to particular industrial verticals. Major business strategies adopted by them, their market positioning, and various recent developments have also been identified in the research report. The major manufacturers providing wireless intercoms profiled in the report include Clear-Com (HME Company), ZENITEL GROUP, Telephonics Corporation, Sena Technologies, Panasonic Corporation, Riedel Communications GmbH & Co KG, RTS Intercom (part of Bosch Security Systems, Inc.), and Commend International GmbH.